The key to a successful launch of a new product is to understand who your target customers are, and what value your product offers them. Among the many tools available, the User Personas are great tools to document who you are building your product for, and what needs it tries to solve for your customers. A User Persona helps to define who your target customers are. Instead of a generic segment of users, a Persona gives an identity to an individual person (real or fictional), helping your team identify and communicate more clearly the user needs. A Persona is a representation of the goals and behaviors of a hypothesized group of users. In most cases, Personas are synthesized from data collected from user research and customer interviews. A User Persona (or simply Persona) is a fictional representation of a customer of your product or service. It describes the motivations and needs of a typical user of your solution. Use this worksheet to develop a User Persona for your users. Create one Persona for each user type. 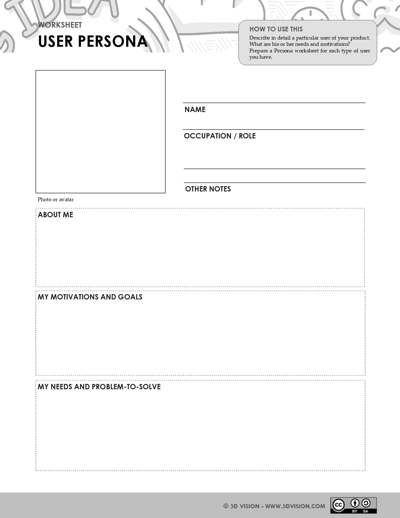 Download the User Persona Worksheet. You may have multiple Personas, especially if you identify different types of customers for your solution, with unique needs and expectations. Each type of customer may be represented by a specific User Persona. Sometimes your customers are from multiple user groups and you may have multiple user types interacting with your solution. Take, for example, a taxi app that is used by both passengers and car drivers. Each user group has very different needs: passengers need to locate the nearest taxi and book a ride; drivers need to be alerted of a ride request, locate the requesting passenger, and manage the payments they received. Instead of talking about generic user segments, you can build a User Persona for a driver and for a passenger. To create a User Persona, start by selecting a person. This can be a real user of your product or a fictional one. The best User Personas come from interviewing, researching, and observing real people. You can even give them the name of the real person they represent. When building your Personas, be conscious of the different user groups and create a Persona for at least one user in each group (e.g. for taxi drivers and for passengers). Well-crafted Personas don’t just represent a generic group of people, but rather a specific individual (real or not). This Persona should have a name, a photo, details of his or her job, passions, and activities. And it should have a list of needs, motivations, or dreams. Select someone who has clear motivations and specific needs, rather than just a generic customer. Can you briefly describe this user? What actions, needs, and motivations are specific to this person? You can download a User Persona Worksheet to help you craft one or more Personas for your product.